New York Times bestselling author and artist James Dean shares a fun-filled I Can Read story featuring Pete the Kitty—the very first Pete the Kitty I Can Read! Pete gets a case of the hiccups, and he doesn’t know what to do! He decides to ask his wisest friends for help, like Grumpy Toad, Callie, and Bob. But Pete is still stuck with the hiccups! Will Pete the Kitty ever get rid of his terrible hiccups? 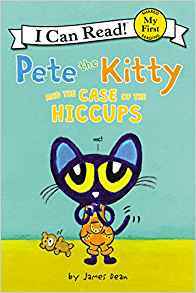 Beginning readers will laugh and easily relate to Pete the Kitty and his search for the perfect remedy for his hiccups. My First I Can Read books are perfect for shared reading with a child.